A crowd of 100 people packed into the show court for this final with the atmosphere building nicely in the lead up. As expected before the match, the opening stages showed a slight contrast of styles. 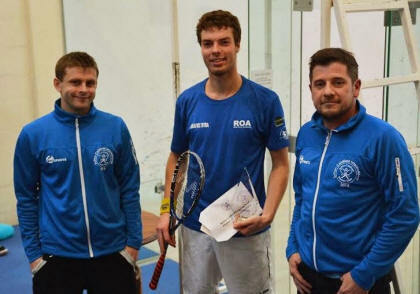 Jan Van Den Herrewegen was looking to mix things up and was the more likely to open up the front of the court whilst Chris Fuller was keeping things more simple. 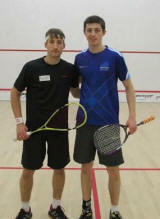 The first game was very tight and could have gone either way, Jan managing to edge it 11-9. It looked in the second game that Fuller was becoming slightly predictable and Jan started to become comfortable, gaining control of the game and taking it 11-6. From this point it looked like a long way back for Fuller and we envisaged a 3-0 victory for Jan.
Fuller came out in the third game with much more attacking purpose, starting to use the boast as an attacking weapon and threatening the front court much more. Whilst Jan was still getting everything back he started to become a bit more ragged with Fuller taking the third game 11-6. The fourth followed a similar pattern with Fuller now controlling the play and making Jan do a lot of work, another 11-6 game for Chris. I feel the start of the fifth game was absolutely crucial, Fuller continued his attacking intent and was well in control of the opening points but managed to find the tin on what would have been the winning shot. This gave Jan a 4-1 lead and looked to give him a new confidence and that extra bit of energy as he extended his lead to 7-1. Fuller does not give in easily and worked his way back to 7-8 before a couple of great points gave the Belgian 3 match balls. The next three rallies were played with a brilliant intensity as both fought for every ball, Fuller managing to save all 3 match balls and draw level at 10-10. In a similar fashion to the start of this game, Fuller seemed to be in control of another two great rallies but just found the tin to hand Jan the victory and earn both players a standing ovation. Fuller took the initiative at the start of this match and definitely looked to play at an increased compared to his previous matches. He was attacking the front of the court in straight lines to prevent Masters having the angles he loves to work with. Masters found a few winners in this game but an equal number of tins, Fuller taking it 11-7. The second game was a much tighter affair as Masters matched the pace and tightened up his own play, reducing the error count. He held two game balls at 10-8 but Fuller hung on and took a vital second game 14-12. It was evident in the third game that Masters was beginning to get frustrated and looking to attack from the wrong positions, making a few mistakes and opening up the court for Fuller to counter. Fuller led 10-5 and looked like he would close it out comfortably but Masters buckled down and pulled back to 10-8 before Fuller took the victory on his 4th match ball. Rooney was off to a flyer in this one, volleying everything and using some fantastic hold and wrist to send Jan all over the court. Some great touch on the volley drop helped secure the first game 11-7. It looked as though Jan had been given a talking to in between games as he came out at a much higher pace and began to dictate a greater number of rallies. Rooney was still playing well but with Jan getting more balls back at an increased quality, Rooney began to make a few more errors as he looked to go tighter and tighter with his shots. Jan took the second 11-6 and the third followed a similar pattern with some stunning rallies but Rooney was just making a few too many errors due to the increased pressure on his game. It definitely looked like the previous four matches were catching up with Rooney as he slipped to a 6-0 deficit in the fourth, Jan eventually taking it 11-5 and the match 3-1. Harris made an explosive start with a series of cross court nicks and fantastic attacking play to lead 8-1. Fuller tightened up and chipped away at his lead with Harris still going for his shots but making a number of errors, an 8-1 lead soon turned into 9-9. Fuller played the last two points well to take the game 11-9. The second followed a similar pattern with Harris looking to attack but at this point but he was being forced to do so from uncomfortable positions, Fuller taking this game 11-6. The third saw a noticeable change of tactics from Harris who seemed more content to extend the rallies and wait for his opportunity. This paid dividends as he took as he took a tight game 12-10 and also snuck the fourth 13-11. At 8-5 in the final game it looked like Harris might just complete the turnaround, but Fuller found a number of winners amongst his patient play to recover and take the match 11-9. It was clear that Ben was struggling from yesterday's five setter and also seemed to pick up a niggle at the start of the match. Whilst it lasted we were treated to an array of fantastic shot making and countless rolling nicks. Several big momentum swings in this excellent quarter final. Fuller looked by far the sharper player to take the first 11-4 and we wondered if Rooney's journey from qualifying had taken it out of him. However he dug in impressively, and gave Fuller less opportunities, taking the second 12-10. Rooney built a big lead in the third and stayed strong to give himself a 2-1 advantage. Another big shift saw Fuller take the fourth game 11-4 and it looked like Rooney was spent. The fifth game was neck and neck to 5-5 before Fuller made 2 or 3 uncharacteristic errors to give Rooney a lead which he never relinquished. At 11-5 and 6-0 up Jan was playing some excellent squash and looked like he would be cruising into the semi finals, Eysele looking shattered from his run this far. Not for the first time this week he knuckled down and just kept going, getting everything back and started to mount attacks of his own. He recovered to lead 8-7, but just like yesterday Jan played the big points very well, winning the second 11-9. The third saw some long rallies, both players covering a lot of ground and was even to 7-7. It looked for a second as though Eysele's hard work may pay off and that Jan may be beginning to tire, but he again shored things up at the business end of the game to complete a 3-0 win. Moran looked to be feeling the effects of yesterdays tough qualifying final in this one. Fuller was too strong and accurate and despite some excellent rallies, Moran found himself doing too much work today. The first two games of this one were tight with Harris seeming to find an extra gear for the crucial points. He was always ahead in a third game full of great shot making. Masters, fresh from him win in Bexley last week made a strong start with some trademark hard hitting and nicks. It was the second game before Jenkins found some rythm, starting to extend the rallies and limit the opportunities for his opponent. Whilst always slightly ahead in the third, Masters found himself under more pressure in the third game with Jenkins starting to impose himself and take control of more points. Some quality retrieval towards the end of the game saw Masters through to the quarter finals. One of the matches of the tournament so far, this one had it all. Long rallies, excellent attacking play and fantastic movement. Mulvey took two out of three tight games before appearing to take his foot off the gas in the fourth, with Ford taking it easily 11-2. Mulvey found himself 6-4 up in the decider but some patient and controlled play from Ford turned things in his favour to gain a 9-7 lead and eventually close out a superb match 11-8. The balcony was packed for this one and the spectators showed their appreciation for a great match. 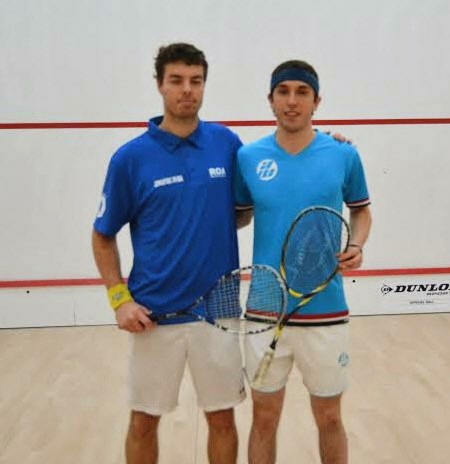 This game was a total contrast of styles with Fuller playing accurate and controlled squash while Rauf looked to open up the court and finish the rallies quickly. It was evident partway through the first game that Fuller was going to pick up too many balls for Rauf's strategy to be effective. A strange match this one. Khan seemed to put up little fight in the first game and lost it comfortably. He came out a totally different player in the second looking focused and began to control the rallies, making Rooney do more work. The third and fourth games were similar to the first with Khan offering up little resistance, I am not sure if he was carrying an injury. The crowds this week have been appreciating Rooney's style of play and range of shots. One word for this match, brutal! 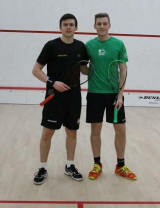 Uherka continued his fine form from qualifying to take the first and looked strong. The second game was an important game which was point for point until the end, Jan just edging it. By this point both players were giving their all and pushing each other to the limit. The third and fourth games were very competitive but Jan managed to keep ahead to take this one in four long games. A very impressive match. Having reached the semi finals in Bexley, This was Eyseles sixth match in five days and to think he was two points away from going out in the first round of qualifying here! Looking full of confidence he was always in control here showing an impressive rage of shots. Noakes worked hard today but looked slightly flat, perhaps due to returning from a tour of the US only yesterday. A match played at a ridiculous pace that didn't seem to let up through the whole match! The first three games were very competitive with both players getting on to the ball early and injecting pace mixed in with some lovely touches at the front. The fourth game perhaps saw Hapers begin to tire and Moran's hold and touch began to pay dividends as he pulled away to take the last two games fairly comfortably. Henderson started strongly and lead 9-6 in the first game and then held a game ball at 10-9 before Uherka recovered to take it 12-10. Uherka's court speed and strength, along with some lovely kills and volley drops saw him take the second game 11-7 which he always led. Henderson was not finished however and clawed back to take the third game and open up the possibility of a comeback. A combination of some great play from Uherka and some uncharacteristic errors from Henderson saw a very unexpected 11-0 in the last game. After a fine run in Bexley last week and a late night five setter last night it was going to be interesting to see how much Eysele had left in the tank. He started the match well using angles and in particular the boast to twist and turn Nightingale effectively. Nightingale tightened up and lengthened the rallies and used the straight drop well in the second game to take it 13-11. It seemed the effects of Eyseles attacking play got the better of Nightingale in the third and fourth games as he seemed to be slightly off the pace. This was a quality and fair match between two players who strike the ball very well. Taylor had a long five set match last night and after a strong start seemed to tire ever so slightly. Rooney's quality into the front of the court began to get more reward and he always seemed that bit in control for the remainder of the match. Sutton first team player Talbot was first up on the show court tonight and was in for a tough nights work against Scottish international Kevin Moran. The match was played at a high pace and despite Talbot playing some great stuff, Moran's quality and speed of play was just too much today. 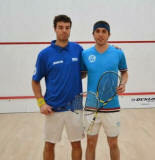 This match was filled with some great rallies, it was Hapers short game that proved the difference. Having helped Sutton to the Warwickshire league title last season, Hodgkins was keen to do well in front of a supportive crowd. This was another game played a cracking pace and the first two games saw the players level until 6-6 before Henderson managed to pull away. The hard work Hodgkins had to put in seemed to show in the third game and Henderson was always in control. Whilst I didn't get to watch much of this match, each game was incredibly tight and could easily have gone either way. 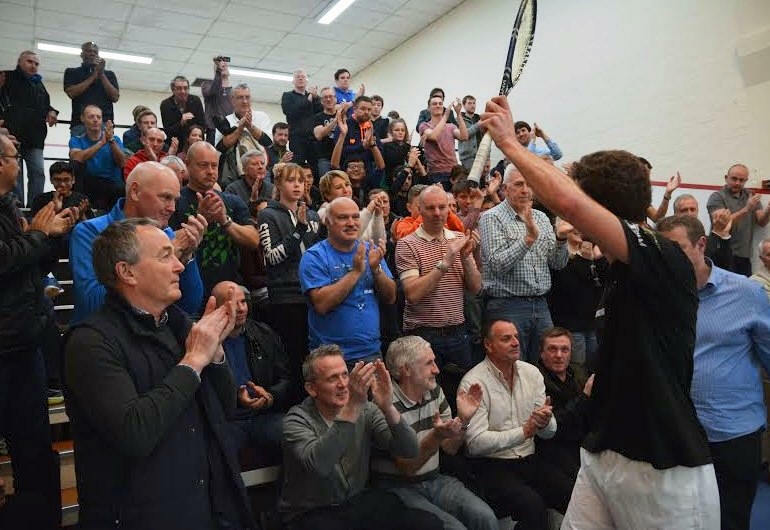 With some quality squash and gruelling rallies, the crowd built Steadily for this match throughout. Sutton's last home player took on Phil Nightingale in front of a loyal crowd. Hayes led 8-6 in the first game with some trademark angles that left Nightingale floundering. Nightingale tightened up and hit back to take it 11-8. The second saw Nightingale open up a 5-1 lead with well constructed rallies and then taking advantage of the loose ball with clinical drops. Hayes rallied and mixed things up well to take the game to 10-10 but Nightingale managed to close it out. Nightingale was always slightly ahead in the third and secure a 3-0 victory. What a match! Whilst Pearson is unknown to the tour he is an talented player and having improved his fitness recently has been scoring some upsets over professional players in league. The first game was tight all the way with Pearson looking to work the ball around and attack whilst Eyesle used his speed and fitness to extend the rallies. Pearson snuck the game 11-9 and was always a couple of points ahead in the second to take it 11-7. The third saw a total change of momentum with Eysele taking a 9-2 lead and winning it 11-4. Pearson seemed to get a second wind in the fourth and we were treated to some fantastic shot making matched equally by Eysele's speed and determination. Eyesele took the game 11-8 and we were in for the first 5 setter of the evening. They were all even in the 5th to 5 all where Eysele pushed on to take a 10-6 lead, Pearson was not finished however and worked his opponent around the court patiently to claw back to 9-10. This was as close as he got as Eysele completed a remarkable comeback to win 3-2. Having taken a 1 game lead Rooney quickly found himself 10-3 down in the second game with Lewis producing some fantastic play to build a big lead .Looking to finish the game quickly, Lewis' lead began to disappear and Rooney played more patiently to extend the rallies. From 10 all both players had game ball opportunities before Rooney took an important second game 16-14. The audience could have been forgiven for thinking that Lewis would not recover from the second game but he kept the quality high to take the 3rd game 11-6. The fourth was even to 6 all until Rooney pulled away to take win it 11-7 and take the match 3-1. A match with so many changes of momentum it was hard to keep track. The first four games were filled with one of the players finding form whilst the other looked slightly short. This changed however in a titanic fifth game battle where both players gave there all in some long rallies. Saving a match ball Taylor edged it 12-10 to seal his place in the qualifying finals.